So as I write this, the Mets will end the so-called first half of the year either 14 games under .500 or 16 games deep (and maybe if we get rained out, 15). Any one is a farce and speaks to a truly dreadful year in which we learned that young players don’t always perform well and older guys don’t stay healthy, first-year managers make lots of mistakes, and the destabilizing effect of a meddlesome and accountability-free front office in the throes of crisis, completely unprepared for a succession. Actually we learned every one of those things before, but thanks for the reminder, Mets. Now here’s the punchline: I’d been slow to catch up to this week’s comings and goings in part because I was too busy going to Mets games. Last Sunday’s nice weather tempted us to head out as a family only to see a near no-hitter. My regular Tuesday night game with my brother was nearly a repeat but notable because I did to recognize the day’s starting pitcher when I saw it listed and I’m a guy who makes it his business to be on top of that kind of stuff. Then on Friday it was the annual outing with scattered former work colleagues. That one turned out nice, with a big assist from an exceedingly sloppy Washington club. So meet Drew Gagnon. He nearly got five innings in, had a little bit of bad luck, but when it was over took an 11.57 ERA back to Las Vegas where he’s got to be wondering whether he’ll ever a shot at big-leaguedom again. Gagnon was issued No. 47, which we last saw on Hansel Robles. Matt den Dekker is also back in action. I liked seeing this addition as the guy could always go and get in center field, and that’s what he’s been doing. He’s wearing 23 now, and not the 6 he used to in his first go-round, since 6 remains tragically bogarted by hitting coach Pat Roessler, and the No. 16 he was wearing in Spring Training had been relegated to since-demoted outfielder Kevin Kaczmarski. 23 belonged last to Adrian Gonzalez. The Mets are racing toward a record number of players on the roster in a single year — an active trade deadline could nearly assure it — but thus far have only re-issued numbers three times (23, 47 and 62), believe it or not. That’s in part because of their willingness to just keep going higher. That’s one thing to watch as the SHaMs (Second-HAlf Mets) get underway. The moves are coming faster than I can mock them, but sadly not as frequently as the losses, for these cursed Mets. Tonight Chris Flexen, who was here presumably as an emergency starter but didn’t get a start even amid an emergency, is headed back to Las Vegas while Tyler Bashlor is up from Class AA. Some prospect watchers have a thing for Bashlor so perhaps he stays for a bit but who knows. If we’re lucky he’ll craft together as good a few months as Hansel Robles, who once upon a time was a stealthy minor league prospect who slipped into the bullpen. Bashlor will wear No. 49, last belonging to Josh Smoker a year ago. As for Robles, he was DFAed last week, as even the talent-starved Mets had had enough of waiting for him to regain the form that resulted in one of 2015’s biggest surprises. 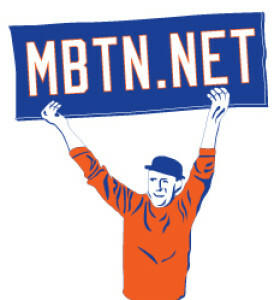 Without him, the Mets still gave up seven home runs yesterday. I was a fan of Robles back when. Tough customer with an ornery attitude, got under the under guy’s skin. 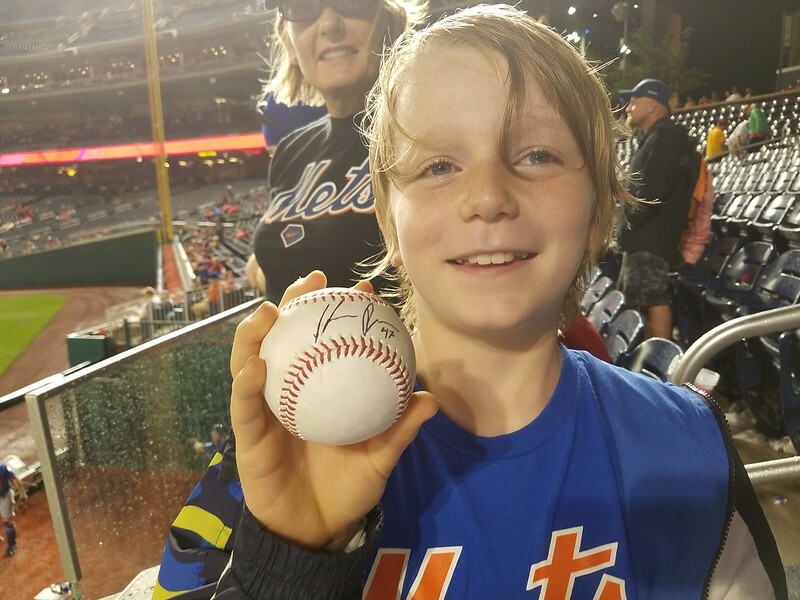 One night during a rain delay in Washington, he signed a ball for my son. Thanks for that, Hansel, and best of luck in Anaheim. When Robles departed, reserve outfielder Kevin Kaczmarski arrived, wearing No. 16, while Drew Smith, the booty in the Lucas Duda trade also came by wearing No. 62: It was only a few weeks back that Scott Copeland (who?) was wearing that number. Paul Sewald in the meantime is back at AAA and Jason Vargas is on the disabled list again, so we have that going for us. Hey! I’d like to invite you all to a special night of baseball, guaranteed to come without a Mets loss. This Thursday at 7 p.m., head over to Two Boots Midtown East, for an event thery’re calling “Reading, Writing and Rusty” where Greg Prince (Faith & Fear in Flushing; PIAZZA; AMAZIN AGAIN); Dave Jordan, author of co-author of the terrific John D’Aquisto biography FASTBALL JOHN; and me (ONCE UPON A TEAM) will be on hand to promote our various projects, sign books, eat pizza and discuss Rusty Staub. Two Boots has great pizza! 7 p.m. June 28: 337 Lexington Ave., between 39th and 40th Streets in Manhattan, convenient to Grand Central Terminal. More details here and here.